Firewalls are essentially designed to protect against attacks that hamper local resources including data, not the communication over the Internet. They act as a barrier between the internal network and the Internet so as to screen through only the information that is considered safe by the Network Administrator. Logically, a Firewall is a separator, restrictor and an analyzer. Where are Firewalls needed and Why? 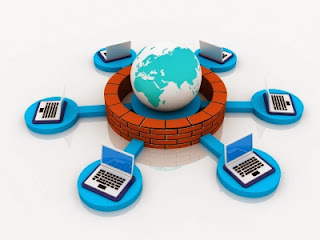 Firewalls are one of the most indispensable components of the System for Security Conscious Users, Networks offering Services to a group of users or the World Wide Web, Corporations involved in e-commerce as well as Educational Institutions. Intrusion: Penetrating into the Local System to utilize resources pretending to be a legitimate user. This is the most common attack on a machine connected to the Internet. Denial of Service: This class of attacks is aimed purely at disrupting the services offered by the machine so that the users of the service are unable to use it at all. Information Theft: This type of attack deals with compromising the Secrecy of Data by simply acquiring a copy of the information serviced by a computer with the only difference that the information is handed over into the wrong hands. Firewalls are primarily needed to prevent, or at least, ratify the occurrence of such attacks. Besides, if and when they do occur, the firewall is meant to help in tracing down the origin of the crime.